Over the last few years movie-going has entered a new and dramatically different era. While summer blockbusters and digitally rendered superheroes still sell a lot of popcorn in large multiplex theaters, other independent cinemas around the country have taken the road less traveled, offering quality, Academy Award-level films, in a more intimate setting; with new, sophisticated food and drink options and other amenities, to a more grown-up audience. This sea-change, made possible by digital technology and the rise of independent movie distributors, as well as more imaginative thinking about entertainment in the 21st century: has been a welcome innovation for people seeking a fun night out but who too often in the past have ended up purchasing over-priced tickets to poorly designed, cookie-cutter corporate theaters with muddy acoustics where they munched stale popcorn in cramped seats next to talkative, texting neighbors. Which begs the question: In a time when so many people can instantly order up a movie online, and even watch it on a big-screen TV in the comfort of their own living room, why leave home at all? Our mission at the Onyx Theatre is to answer that question quietly but confidently: this is the way movies were meant to be seen. From the warm ambiance that greets you in our lobby; our selection of treats, savory snacks, select wine, locally brewed beers, and other refreshments, state-of-the-art picture and sound, plus ultra-comfortable seating in our two, snug (twenty-nine seats each) custom-designed* screening rooms, every facet of a visit to The Onyx aims for more than simply watching a great movie. 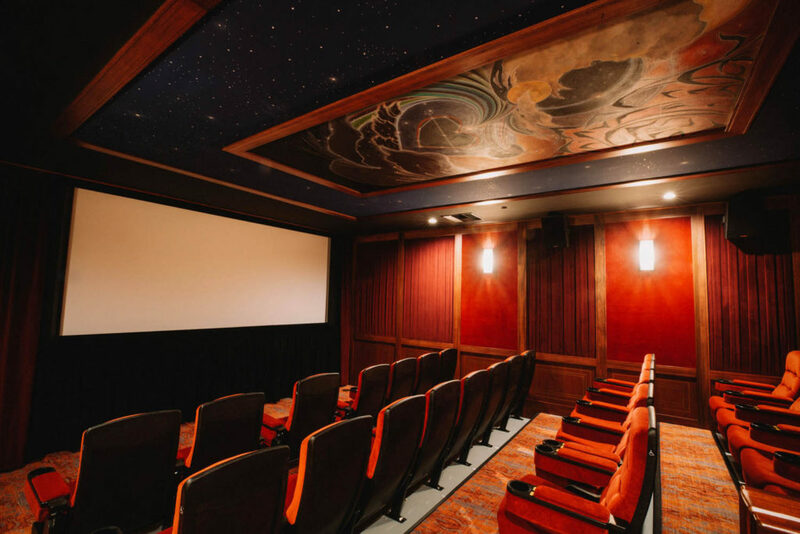 As a genuine arthouse cinema, we’re unabashedly committed to bringing to the Sierra foothills the finest, funnest, smartest and all-around best offerings of independent first-run titles from Hollywood and around the world. Film is at the center of The Onyx experience, and our hope is that the people sitting in our seats will connect with the dramas, comedies, documentaries and other works we present; creating a shared experience in a cozy, friendly environment where you might even feel or learn something you didn’t quite expect, or make a new friend. We know we don’t look or feel or do things quite like a typical movie theater, but that difference is what we believe in, and it’s what we hope will keep you coming back and bringing your friends (old and new) along with you. Stay in touch with us. We'll send you a weekly update of movies playing and any coming special events!